Mundane Michigan and An All-Female Racing Series?! The race at Michigan was just that- a race. There wasn’t anything too exciting about said race other than the debris caution thrown towards the end of the race. Martin Truex Jr added to his collection of segment wins collecting two of them during the race’s first two segments, however it was Kyle Larson, who was as Mike Joy ironically pointed out during the national broadcast, was driving a Cars 3 inspired paint scheme and firesuit who won…on opening weekend of a movie that was number one in the box office. For me personally the race was just an eh on the excitement meter but as a long time race fan I know that these things just work out that way sometimes. Drivers that impressed: Denny Hamlin, Chase Elliot, Ricky Stenhouse, Jr. However, what I am more drawn to writing about this week is something that was brought to my attention actually via IRL and now Sportscar driver Pippa Mann. For those who aren’t familiar with Pippa- she is a British open-wheel driver who started in karts in Europe and worked her way up through the open wheel ranks in Europe before moving to the United States in 2009 to race Indy Lights and then transitioned to IndyCar in 2011. She is currently the fastest female driver on record at Indianapolis Motor Speedway at 230.1 mph set this year during May’s “Fast Friday” precursor to the Indy 500. This year she is also making her debut into American Sportscar Racing driving with Prestige Performance and Wayne Taylor racing. If you have followed my Amy’s NASCAR Reading list posts you might remember me mentioning author Tammy Kaehler and the Kate Reilly Racing Mystery series- Pippa Mann provides Tammy with the technical/research assistance needed to write a series from the view point of a driver without being a driver. Anyway, I enjoy following Pippa on social media and it was through that that I found out that there is talk in Europe about creating a female-only racing series to give “girls” a place to race instead of with the young men. Pippa wrote a brilliant post about it on her blog- that I just want to highly suggest you read called The Handmaid’s Racing Series. The points she makes are spot on in her post but there is one specifically that caught my attention and I will point that out to you here by paraphrasing the last couple of sentences in Pippa’s blog post. Why would you want to strip away the ability for females to compete in one of the few sports out there in which women and men can complete against each other equally, instead setting up a special “sideshow series for girls only” as Pippa so eloquently called it? Honestly the whole idea of it kind of insults me as a female motorsports fan. I want to watch all drivers compete in the same series with the same opportunities for sponsorships and support. 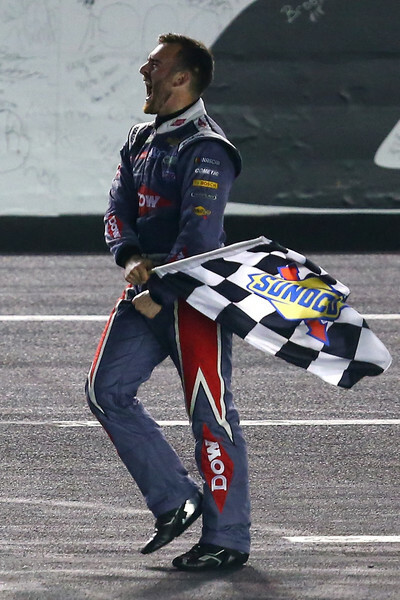 Over the last several years the cup series in NASCAR has suffered as some of the elite drivers retire or just disappear (Jeff Gordon, Tony Stewart, Carl Edwards, Greg Biffle) and for me the excitement behind NASCAR started to wane significantly – especially since “my” driver retired last year. This year the writing of the posts don’t come organically as they use to when I always had a horse in the race, a dog in the show, however you want to term it. Sometimes I struggle for what I want to write about and I am sure that it shows in my posts. However that is not the case this week. This week after the race I sat down with my notepad and it flowed naturally like it use to. Why? Because I was excited with that race in Pocono- which is slightly odd because if you go through my archives I refer to this track as evil on multiple occasions. Why was I excited by Pocono? How could you not be? You had a pole sitter who lead a hundred laps or so and won a segment in Kyle Busch. You had Kyle Larson who had been strong all day win a segment. You had a seven-time champion and most recent race winner suffer a brake failure and slam the outside wall quite hard while another Chevy driver suffered a simultaneous brake failure a few seconds later and end up catching fire near the inside wall and had to jump out of the car before safety crews arrive. This fire caused a red flag. You had mother nature heating up the track and the drivers. You had at least drivers with shifting problems- which caused the most popular driver in NASCAR to go home early. You had a first time cup series driver get nailed for speeding twice during the same pit stop sequence. Oh and don’t forget one of NASCAR’s most prominent teams had three of their four drivers suffer incidents causing them to be unable to continue. Oh and that doesn’t even take into account that finish and boy howdy was that a finish. So let’s talk about that finish: First Ryan Blaney has to fight to pass Kyle Busch. And everyone knows Kyle Busch isn’t going to be easy to get around nor should he be. Kyle fights to retain his position hard including some incredible blocking from the inside up to the wall. But Ryan Blaney eventually is able to get his nose underneath Kyle and get by him. But then you have Kevin Harvick- who is also known to be one of the best at wrapping up a race. Darrell Waltrip doesn’t call Harvick “the Closer” for no reason afterall. So Blaney now has to keep Harvick behind him, awhile continuing to drive a flawless race because you know that the minute Ryan Blaney so much as wiggles Harvick will get by him. But alas Blaney was able to hold off Kevin Harvick and take the checkers. So that was a great ending. But what I left out- is that Ryan Blaney did all this with out being able to communicate on the radio with his team. While he could here them- they couldn’t hear him and had to result to hand signals to let them know what kind of issues he was having. And the best part of all? Was that during the pre-race show Chris Myers asked Jeff Gordon and Darrell Waltrip if he would win this year and they both said NO!! HA! This wasn’t a fluke and it was just a matter of time before Blaney won. However he was not alone! 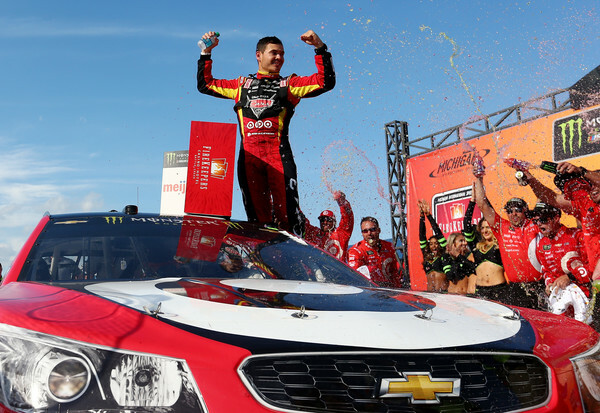 The younger drivers all really flaunted their stuff during the race at Pocono. I mean look at these finishes: Ryan Blaney (winner). Erik Jones (3rd), Chase Elliott (8th). I mean it- the young guns are coming. I am a NASCAR fan- but moreover I am a motorsports fan and there is no day quite as good for us motorsports fans as May 28th. It’s a day of solid motorsports- starting with Monaco in the wee (for a weekend day) morning and ended with NASCAR’s version of the endurance race, the Coca-Cola 600. And sandwiched in the middle was the ultimate event in all of motorsports- the Indy 500. I will be the first to admit that as much as I love motorsports- I also love sleep- so I didn’t catch much of the F1 race in Monaco (remember I am on the West Coast). But I caught every lap of the Indy 500. There is just something about the race that makes it special- so special I will even sit there and watch the pre-race pomp and circumstance that surrounds it- and I will do it with glee in my motorsports loving heart. I agree with the people online who state that “Back Home Again” without Jim Nabors is just not the same. It totally isn’t. I am pretty sure I am the only native born Californian (who had never even been to Indiana) who knew the words to it in elementary school. It was because when I was a kid- I looked forward to the INDY 500 with great abandon. Bubble Day was my favorite qualifying day and I would sit there on the edge of my seat waiting to find out who would make the field and who would be bumped. It was my thing. I found this year’s Indy 500 to be much more exciting than those of Indy 500′s in the recent past. There seemed to be more racing for position and less follow the leader train style. THAT is what I look for in a race to make it exciting for me. I like to see people passing each other…trying to pass each other. It was a good race with an exciting finish. What was NOT exciting was the Jay Howard/Scott Dixon crash- for many reasons. I was of course rooting for Jay Howard (and Pippa Mann) since he was the Team OneCure driver…but that withstanding that accident was horrifying. With all the safety measures taken across ALL forms of motorsports it’s easy as a fan to become complacent when it comes to the dangers associated with all forms of racing. And while it was wonderful to see that driver capsule hold strong around Scott Dixon- it was scary to see the car take flight like that and come crashing down nearly cockpit down on the retaining wall…only to then roll and indeed land cockpit down on the pavement before righting itself. I was sure we were going to see him removed on a stretcher. When he got out of the car and WALK to the ambulance. Wow. After a walk of the dogs and doing some other chore like things in between I sat down ready to start the second half of my motorsports day and I was just as excited. This is NASCAR’s version of the endurance race- it’s 600 miles! That is THE longest race. And I know some people don’t like the long races- honestly most of the time I am one of them…but I still think there needs to be at least one 600 mile race. It’s a whole different skillset for the drivers. Just like I am a hearty believer in the road courses- I love road courses because they again require a whole other skillset of the drivers. Do I think the resin helped the 600? Yes I do. I saw lots of passing and racing for position. What didn’t help was the rain delay- but that happens. I am glad it wasn’t along delay as far as rain delays go. It rained and they were able to get the track dry and the race underway in an hour and forty minutes or something like that? That’s pretty quick for a weather related delay. I am thankful that the air titans where there to help with that and get the race back underway. Now that I consider myself a fan without a driver I necessarily pull for- I find fuel mileage races more exciting I will admit that. It’s a part of racing- who figured out their fuel mileage the best. Who was able to each out that extra little dribble of fuel in their car? Congratulations go to Austin Dillon’s team for doing just that. Now let’s talk about the post-race event that everyone seems to want to talk about- Kyle Busch’s short comment in post-race media. “Nothing surprises me any more. Congratulates. *mic drop*” As always there are people on both sides of the fence with Kyle’s comments. I can see and acknowledge both sides of it. I see he’s obviously disappointed. He’s probably hungry (I agree with Dale Jr) and tired. The last place he wants to be is answering questions about a race he REALLY wanted to win but didn’t. Yes it’s his job and he should meet all his media obligations as part of that job. Does it bother me? Not really. He was rude. People have bad days. He was in a bad mood. I am not going to defend his actions but I am not offended by them either. It is what it is and I take them at face value. Drivers say things in the heat of the moment and the face of defeat out of their passion for the sport- as a Tony Stewart fan this is something that I know and expect from drivers so it does not bother me. This behavior and passion for his sport is what makes Kyle Busch Kyle Busch and without a Kyle Busch the sport would be boring. Now I want you to ready for this because I am probably going to blow some socks off here- because I am about to defend Brad Keselowski. After the media got a hold of Kyle’s words, Brad tweeted something to the effect of him not being sure that Kyle Busch’s behavior is the way to define “hating losing” and that he should probably just keep his mouth shut but he “was taught to hate losing by working harder next time, not by being disrespectful to others.” That is Brad’s opinion and it’s articulately voiced. Andy Graves, a Toyota Racing Development executive got involved and tweeted at Brad that “should have just kept his mouth shut.” That was totally uncalled for in my opinion. You either like Kyle or you don’t. You either like Brad or your don’t, but as an executive representing a manufacturer in the sport I think you should be held to a slightly higher standard in how you voice your opinions. (You can watch Kyle’s comments, read Brad Keselowski and Andy Grave’s tweets in one place here in this article on Fox Sports: NASCAR). While watching the beginning of the Kansas race I thought the big thing I would have to discuss was Chase Elliot clipping Michael McDowell as Elliot was leaving his pit and McDowell was entering his. Honestly I am surprised that doesn’t happen more often. I think that really that’s his crew chief Alan Gustafson was not on the ball watching for other cars as Chase was leaving his pitstall. Happy Motorsports May everyone! I am obviously a huge fan of motorsports in general- not just NASCAR although NASCAR the main focus of this blog. So May is a big month in the motorsports world. I am pleased to say as a reader I have also been looking forward to May. Why? Because one of my favorite author’s was releasing a book today and I know you are going to LOVE it. Speaking of readers- some of my fellow readers might understand this feeling I get. It’s a feeling of incredible anticipation that the next new book by a beloved author until that moment when you finally have said new book in your hands only to then experience a fairly significant dread about the fresh book in hand. What if the book isn’t all that I hoped it would be? What if, gasp, I don’t like it? What if my high expectations are disappointed? Maybe I am alone in these feelings but I have them quite frequently with my “beloveds” as I call them when they have a release day. I don’t get it when I am reading a new-to-me author because I usually go into those books with low expectations. But I hold my “beloveds” to a higher expectation and then I worry that I am setting myself up for a big disappointment. Am I the only one? This feeling of dread hit me when I pulled out the advanced readers copy of the latest Kate Reilly mystery Kiss The Bricks by Tammy Kaehler from the package. I have loved all the previous books in the Kate Reilly series and I always greatly anticipate the next book in the series. For those who are unfamiliar with the series- each book takes place entirely during a race weekend (or weeks in this case). My anticipation/dread was really two-fold for Kiss The Bricks. Not only is it the next book in the series about racer Kate Reilly but it also takes place during the weeks preceding and including the Indianapolis 500 (which takes place in real life at the end of this month). It’s an iconic race and so much could go wrong. But luckily this book did not disappoint me in either aspect. It seemed like forever since I have watched a race? Why? Because first we had the Easter break with no racing and then first race back from Easter was Bristol which was delayed until Monday. Well we are coming up on enrollment deadlines at work so it wasn’t possible for me to be able to sit in my office and pay attention to the race as it happened. 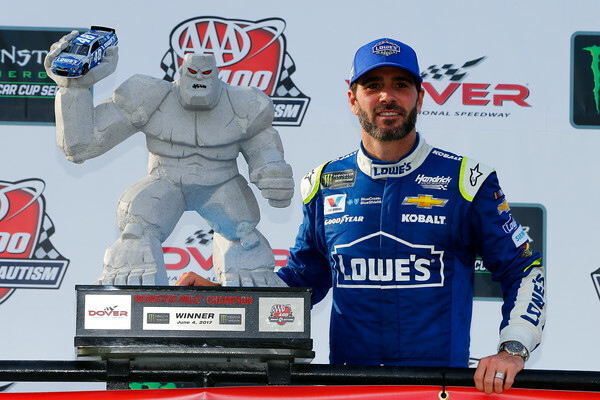 I knew I would find out who won (Jimmie) and I heard that the racing was really good at Bristol- which made me jealous that I decided to forgo DVR’ing it. Why would I do that? Well there are a couple of reasons. I knew I would know who the winner was before I could get home and watch it (and indeed I did) so I would have already known the outcome. Plus- honestly I didn’t think I would feel like coming home and watching a race. Too bad because I heard from more than one source that the racing at the track was excellent. There was so much terrible weather across the United States I was grateful that they were able to race on Sunday at Richmond. I was jonesing for some racing action and I honestly think I got it. When I am talking about racing action- I am talking about side-by-side racing for position. It seems to me that NASCAR was right after all with this segment racing and it really shines on the short tracks. It seems to put a sense of urgency in the racing that seems to make it so that the drivers are not just biding their time for the end of the race. It seemed that a big complaint among the race fans I follow were the in-race penalties during the race at Richmond. There were several pit road speeding penalties, a couple of lose tire and equipment leaving the box penalties but no more than any other race I thought. So I am wondering if people weren’t talking about the commitment violations for pit road (I guess technically we can’t really call them commitment cone violations since they don’t use a cone at Richmond but instead use an orange square. Apparently it use to be okay if your right side tires hit the orange commitment square on the track but this race they changed the rule so that the tires had to be completely on the left side of the box for pit road and the right side of the box to remain on track. During the national broadcast they said that the change was communicated during the driver’s meeting and I don’t know if a few of the drivers just weren’t paying attention to the rule change or if they were unaware. I think a lot of people are talking about the incident with Joey Logano ducking in quickly and blocking the view of the commitment box from Kyle Busch who then clearly ran over the box because it was blocked from his view by Logano. Some people think it was a dirty thing for Logano to do. Some people think Kyle Busch is being a whiner. I can honestly see both sides. As the race leader Joey Logano’s job is to protect that lead. Ducking into the pits at the last minute is nothing new- it’s probably one of the oldest “tricks” in the pit strategy sleeve. Nor do I think Kyle has reason to be called a whiner- he was upset- that penalty cost him a decent finish and possibly a win. It’s quite understandable to be upset with the call- especially when you yourself can’t see the box because the view is blocked by the car in front of you. Kyle doesn’t have the vantage point the people on TV have or even the people in the stands. I would call that a “racin’ deal” pure and simple. Stewart-Haas had a pretty good day overall. All four cars finished in the top 20 with one top five (Harvick), one top ten (Busch), One top 15 (Bowyer) and one top 20 (Patrick).